Region: This borer can be found throughout North America. Life cycle: This borer produces one generation each year, overwinters as a larva in its burrow and usually completes development in late June or July and goes into the pupal, or resting, stage in the soil nearby. Three weeks later, the adult wasp-like moth emerges. The eggs, which are laid several days after emergence, hatch within ten days and the worms bore into the bark just below the surface, beginning the cycle all over again. Physical description: The 1 1/4 inch larva is a pale yellow or white Caterpillar with a brown head. The adult is a wasp-like moth. The male is steel blue with yellow stripes and the female is steel blue with an orange band around the abdomen. The eggs are brown or gray and are laid in small groups near the base of trees, on trunks and branches, or on weeds, leaves, and clumps of soil. 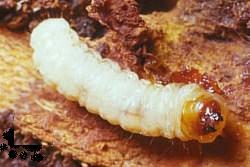 Feeding characteristics: This borer attacks the apricot, cherry, peach, and plum trees, chewing the inner bark of the lower tree trunk. A mass of gummy sawdust is visible at the base of infested trees. Controls: Avoid creating entry sites by keeping the trees well nourished, allowing them to better resist attack. Some growers plant garlic cloves close to the tree trunk. Others use a ring of mothballs on the soil or a ring of tobacco dust 2 inches wide. You can also tie nuggets of soft soap around the tree base and up to the crotch. When it rains, the soap runs down the trunk and into the ground. The soapy taste repels both the moth and larva. If you have trees less than three years old, try poking a wire up borer holes. A gummy discharge forms around the holes and serves to seal the injury. Keep all trash and debris cleaned up and avoid damaging the trees bark with cultivators.